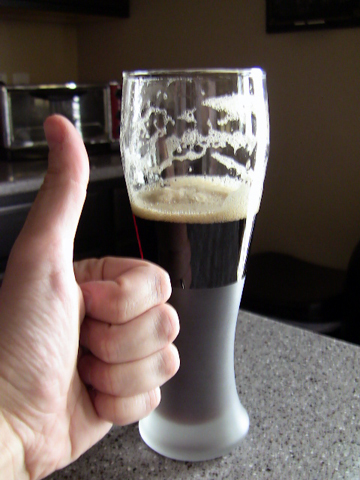 Editorial: Another Justin Beerit Beer Review. 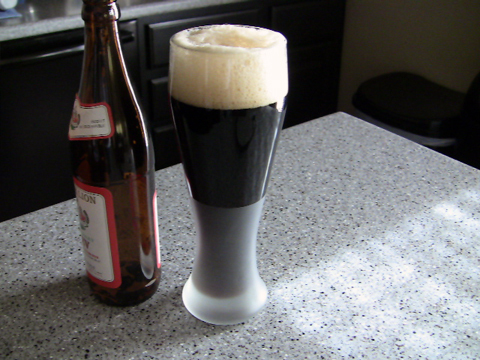 Mr. Beerit promised me that this review would call for a “real man’s beer” rather than that girly-fied beer called Budlight Lime….Without disappointingus, he came up with something called Lev Black Lion….You know what they say, Once you go BLACK, you never go BACK! OOOWW! Brewer: Měšťanský pivovar Havlíčkův Brod a. s.
I will review the beers on the standard categories of Appearance (A), Smell (S), Taste (T), Mouthfeel (M), and Drinkability (D). Today’s beer is Lev Black Lion, brewed by Měšťanský pivovar Havlíčkův Brod a. s. out of the Czech Republic. I was introduced to this beer back in 2000 while attending a party. It comes in a large bottle (16.9 oz.) and only costs $2.05 here in Utah (which is quite cheap considering it’s not unheard of an imported beer costing $2.85 per 12 oz. bottle). It’s likely far more affordable in your neck of the woods, if you can find it. According to the website linked above, it’s only available in California, Utah, North Carolina, and Washington. If you’re outside of those states, sorry (perhaps a road trip is in order? Utah anyone?). Though this is a favorite of mine, it’s been a few months since I had a Black Lion. I pulled the beer out of the fridge and poured it into my favorite drinking glass. The glass quickly filled with head. This is not uncommon being that we’re at about 5000 feet here in Utah, but this was more head than one would normally expect of a beer. The beer was very dark, though not stout black. The head showed nice lacing and had a wonderful caramel color. I smelled the beer. Mmmmm, malty. Quite sweet. I could detect very little hop aromas. If you’re a huge fan of deeply-hopped beers like IPA’s or Pilsners, then you might not like this beer. I sniffed again. Chocolaty. Even a hint of coffee. Those deep, dark roasted malts dominate the aromas here. It’s quite enjoyable, really. I could sniff on this beer for a long time and be okay. I had stopped off at the State Liquor Store after work today to pick up this Black Lion (with a few other libations), and had intended to drink it with dinner. My wife was out at Mommy & Me swim lessons with Babygirl, and I was home cooking dinner. The scallops were wrapped in bacon, the asparagus was ready to go on the grill (and to make our pee stink. Damn you asparagus, but I love you so despite your flaws!). I had the rice cooking in the rice cooker. Everything was ready. But, I couldn’t wait. 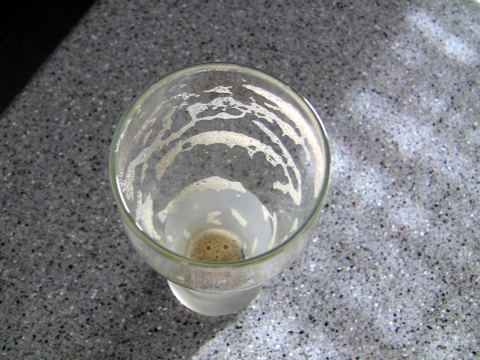 I poured the beer early and enjoyed her before the food was done; however, it would have gone perfect with the meal. Onto taste. The first impression is that the aromas were not misleading. Roasted malts, chocolate, a hint of prune even (like aged Muscat). Is that butter I taste? A little, yes. Some nutty flavors, too. This is a delicious beer. Very little in the way of hops, but they aren’t needed. This definitely doesn’t taste like a dark beer, with the heaviness they usually impart. This is a lighter dark beer, very appropriate for just sipping, but hearty enough to stand up to most meals. Mouthfeel is fine. A little too thin perhaps, but that might be just an illusion what with all the dark and sweet flavors. The carbonation is adequate. This beer is very drinkable. The light and creaminess allow this beer to be easily consumed at a party or meal. I wouldn’t think this would be the go-to beer after a grueling, 4-hour mountain bike session, or in the middle of a sweltering, desert summer as a crisper, less cloying beer would be better suited, but perhaps it could hit the spot. This one certainly worked for me at 6pm on a Monday. This beer isn’t for everyone. Some will find it lacking (most likely in hopiness). I find the sweetness, and low alcohol content, quite enjoyable in these times of 8%, triple hopped brews. Some days a little bit of caramel is what is needed. A: 4.5. Dark, thick caramel-colored head, nice lacing. S: 5. Chocolate, caramel, coffee. Sweet. T: 4.5. As above. No hops to speak of. Lighter than anticipated considering its color. M: 3.5. Thin. Carbonation adequate. D: 4. Good. Low alcohol content allows multiple beers. Awesome review! I gotta find me one of those beers, it looks like it will suit my taste. It really is a good beer. An old standby for me. Hope you can find it, man. Let me know your thoughts, if/when you do. This week’s beer will be on the opposite end: hoppy as hell!!! !